Welcome to the R-CAT website. The Riparian Condition Assessment Toolbox (R-CAT) is a suite of stream network assessment tools. These tools are designed to delineate valley bottoms, assess riparian vegetation, evaluate floodplain condition and estimate recovery potential of riparian areas. The stream network models consist of the following: the Valley Bottom Extraction Tool (V-BET, Riparian Vegetation Departure (RVD) tool, Riparian Condition Assessment (RCA) tool and Riparian Recovery Potential (RRP) tool. These tools are intended to help researchers and managers assess riparian condition and recovery potential over large regions and watersheds. 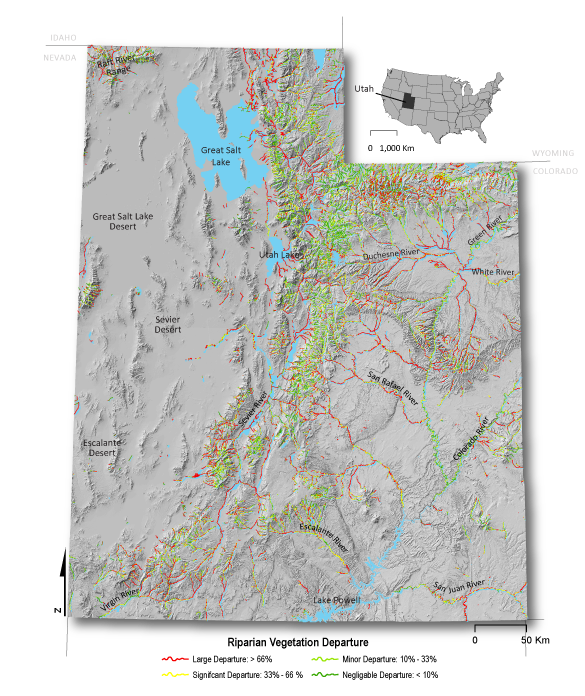 These network models were first developed and implemented across the Colorado Plateau Ecoregion and the state of Utah (see Utah Implementation page). The models are now being run for the Interior Columbia River Basin (see Columbia River Basin Implementation page) . The R-CAT models can be run with nationally available existing GIS datasets or high resolution landcover and DEM datasets. The ETAL development team consisted of Wally Macfarlane, Jordan Gilbert, Joe Wheaton, Josh Gilbert, Chalese Hafen, Martha Jensen, Elijah Portugal, and Peter McHugh. LANDFIRE 30 meter vegetation data is sometimes too coarse to provide sufficient detail to adequately map riparian vegetation. LANDFIRE 30 meter vegetation data tends to underestimate the spatial extent of invasive riparian vegetation. - While higher resolution imagery is used in some localities to drive landcover and vegetation classifications, nothing yet exists that is freely and nationally available. Riparian condition is overestimated in incised and entrenched streams because incision and entrenchment are currently not considered in the Riparian Condition Assessment. - Incision is straightforward to identify through manual reconnaissance, and with the aide of higher resolution topography (not typically possible with 10 m NED). Riparian recovery potential tends to be overestimated because the model currently does not account for water diversions and dams that limit the recovery of riparian areas. - Most states do not have these data in a consistent format, much less at a national level. If you are interested in helping us improve R-CAT please contact us. We view these R-CAT products as a first iteration and as better input data is available the output products will improve proportionally. The Utah Division of Wildlife Resources (UDWR) through Pittman-Robertson Wildlife Restoration Act (PR) funds. Subsequent funding and support for application of these products in the Columbia River Basin, has come from Bonneville Power Administration through Eco Logical Research. RCAT is fully documented for those looking to apply the scripts or coders looking to extend the scripts. The current Python source code is open source and we have developed ArcGIS tool boxes. Source code is available at https://github.com/Riverscapes/RCAT.